Last year cannabis was smoked by 2 million people in the UK, making it the most commonly used illicit drug. Around a third of 16-24 year olds have tried it at least once. But cannabis has changed a lot in recent years. ‘Skunk’ is a potent form of cannabis that now dominates 80% of the British market. Some believe it is far more addictive than other forms of cannabis, such as ‘hash’ and can provoke paranoid episodes, psychotic symptoms and memory loss. 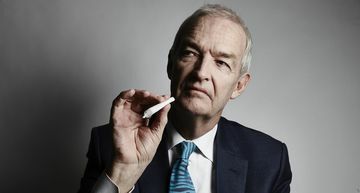 In Drugs Live: Cannabis on Trial volunteers – including Jon Snow, Matthew Parris and Jennie Bond – will be seen taking part in a ground-breaking scientific trial looking at the effects on the brain of two different forms of cannabis – ‘skunk’ and ‘hash’. Another volunteer will be going through the trial live in the studio. Jenny Bond said: "Nothing made me feel uncomfortable. The fact that I was perhaps hallucinating slightly was quite nice really, it was very floaty feeling. I didn't like the experience much but certainly didn't hate it. I'll be intrigued to see what all the results are." The six-month trial, which has been designed by one of the world’s leading experts on the effects of illegal drugs on the brain, psychopharmacologist Professor Val Curran and conducted at UCL (University College London). Former government drugs advisor, Professor David Nutt of Imperial College London, will also feature in the programme. The double-blind trial, which is being majority funded by Channel 4 with additional funding from DrugScience and the Beckley Foundation, has full ethical approval. On three separate occasions healthy volunteers took controlled doses of different forms of medicinal cannabis as well as a placebo under laboratory conditions at UCL, supervised by medical staff. Unlike most other studies, which simply ask people what type of cannabis they use, this trial administered carefully measured amounts of cannabis each with a specified chemical profile. THC (Tetrahydrocannabiol) in cannabis is what makes people feel ‘stoned’. In less potent varieties like hash, THC is about 5% of the plant but in highly potent ‘skunk’ THC levels have increased to 15% or more. ‘Hash’ also contains cannabidiol (CBD), which can act as an antidote to some of THC’s effects; skunk has virtually no CBD. In order to test whether CBD is an ‘antidote’ to THC, Professor Curran’s team compared a normal dose of skunk with a much higher dose of hash. This meant that volunteers inhaled equal levels of THC; the only difference is that hash also contains a substantial amount of CBD. The new programme, which is presented by Jon Snow and Dr Christian Jessen, follows the success of Channel 4’s Drugs Live: The Ecstasy Trial in 2012 which was watched by around two million young people in the UK and many more across the internet. As well as fMRI scans and cognitive tests showing what is going on in the brain, it will also look at the neurological and psychological effects of the two forms of cannabis on memory, appreciation of music and psychological wellbeing. Professors Curran and Nutt will describe the chemicals in cannabis that are responsible for the effects seen. They will explain how they differ between the two forms of the drug, look at the potentially positive effects of cannabis, as well as the risks. And a live studio audience will debate the effectiveness of the UK law using examples of legalisation and medical use from around the world. Alongside the programme will be extensive online resources and links to support and advice at channel4.com/drugsliveand viewers will be able to interact via social media. The results of the trial will also be submitted for publication in peer-reviewed journals.